Worldwide, the incidence rates for inflammatory bowel disease (IBD) vary from 0.5 to 24.5 per 100,000 people (0.012%). It has been estimated that the risk of CRC in IBD patients increases by 0.5% per year after eight years of the disease. Many recent studies proposed aminosalicylates as chemopreventive agents for colorectal cancer (CRC) development in IBD. The aim of the present study is to conduct a meta-analysis to evaluate CRC incidence rate reduction with the use of aminosalicylates in patients with IBD, and to compare it to CRC incidence in the general population. The PUBMED engine was utilized to search for relevant literature by use of specific search criteria and experts consult was sought where appropriate. All papers were scrutinized for 1) total sample size, 2) defined exposure to aminosalicylates, 3) total number of exposed and un-exposed groups, and 4) CRC outcomes. Three case-control studies from Europe satisfied our inclusion criteria, containing 236 cases of CRC and a total of 775 subjects (performed between the years 1965 and 2001). CRC incidence in patients not on aminosalicylates therapy was averaged to be 1.89%, while patients on aminosalicylates therapy had an average incidence of 0.67%. The European, age-adjusted CRC incidence rate was estimated to be 0.05%. Collective analysis showed a significant link between aminosalicylates and CRC incidence rates among IBD patients treated with aminosalicylates, compared to non-exposed IBD population. Pooled results of these studies support a three-fold reduction in CRC incidence in the treated IBD population. This reduction continues to approach a general population CRC incidence rate. However, these studies presented pre-immunomodulator therapy data. Moreover, publications continue to report varying degrees of benefit. 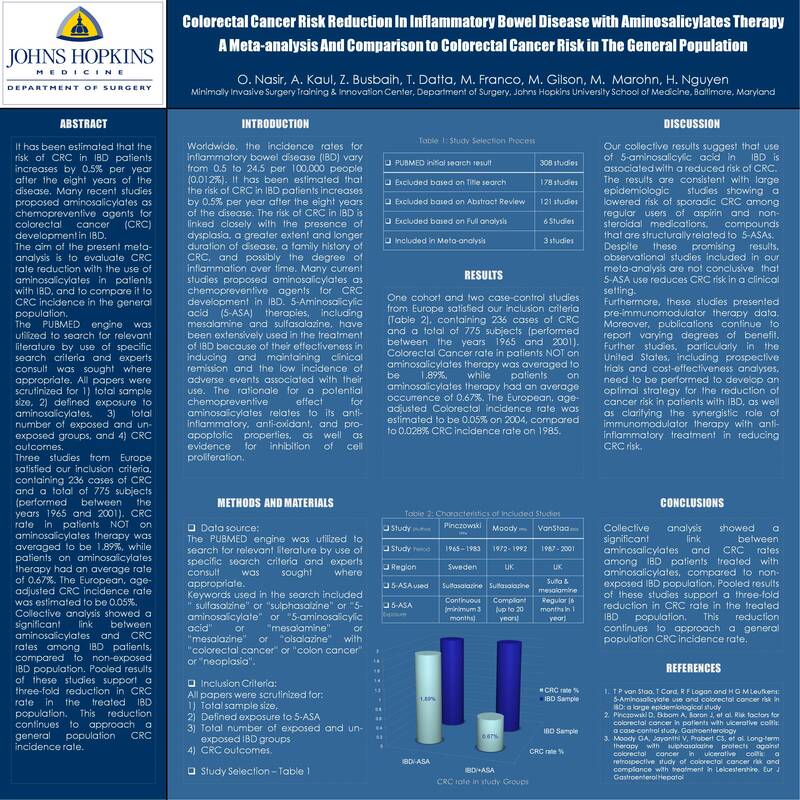 Further studies, particularly in the United States, including prospective trials and cost-effectiveness analyses, need to be performed to develop an optimal strategy for the reduction of cancer risk in patients with IBD, as well as clarifying the synergistic role of immunomodulator therapy with anti-inflammatory treatment in reducing CRC risk.